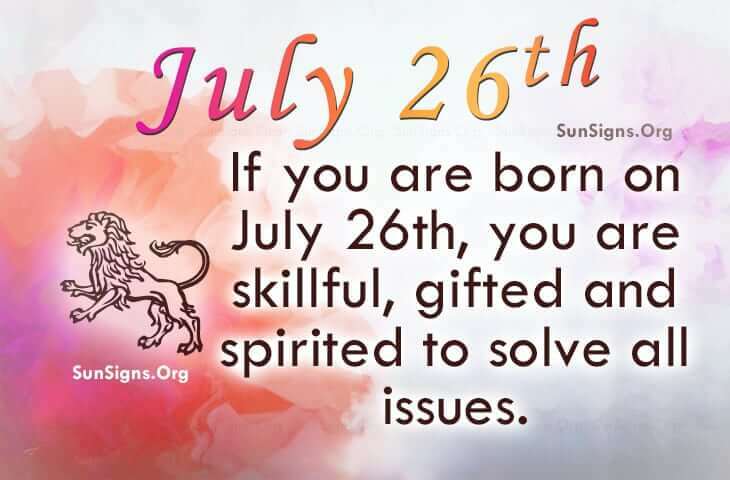 Famous people born on JULY 26 are Leos who want the best out of this life. They don’t mind working to achieve what they want. Being skillful gifted and spirited, they tackle problems with the same drive that they do with things that they are passionate about. Because of their many talents and gifts, people look up to them. When they have a problem, they come to them especially if it is about money. They have a way with money and managing it even in the toughest of times. When it comes to work, it doesn’t matter if the July 26 famous celebrities are by themselves or with a group of people. They can function within each capacity without fear. They are a Leo who learns quicker and easier by doing. They’re smart beyond expectations. They have the ability to be a doctor of medicine or within the psychological aspects of healing. If not, then they could try their hand at the judicial system. As far as romance is concerned, they like to take the lead. They don’t talk much about their feelings so their partner will have to look for the clues. Famous people born on July 26th have a tendency to be a jealous and possessive lover. Those born on this day may have a better success rate with relationships if they could learn to relax, open up and trust more.